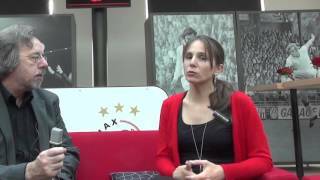 8 Oct 2015 Amsterdam - At the Third eScience Symposium, recently held at the ArenA in Amsterdam, The Netherlands,Primeur Magazinehad the opportunity to talk with Ana Lucia Varbanescu, an assistant professor in the Informatics Institute at the University of Amsterdam on the efficiency of modern heterogeneous systems and has a background in high performance computing at Delft University of Technology and the Amsterdam Free University. Heterogeneous computing uses the GPUs and CPUs together in a good fashion. This is what we have seen in the past couple of years. We come from a period where people have been using GPUs for many applications and trying to get the most performance out of that. This was a good development where we got interesting performance results. However, what we are now advocating is that the GPU is only part of the platform that uses heterogeneous computing. Using the CPU is as important for performance as using the GPU because many applications are diverse enough to use both types of devices and other applications are simply so compute-intensive that any additional resource like a CPU will be helping in terms of performance, Ana Lucia Varbanescu toldPrimeur Magazine. Primeur Magazine:Can you give an example of an application that you work with? Ana Lucia Varbanescu:We worked on many scientific computing kernels starting from the simple metrics operations and linear algebra, going to the more complex image processing applications. The most interesting application so far has been an application on sound ray tracing which is actually an algorithm developed by a student in aerospace engineering at the Technical University in Delft. We were able to accelerate it up to real-time computing by using both the GPU and the CPU. This was very important for their own research in which they really tried to get almost virtual reality experience for sound, not for video. Primeur Magazine:What exactly was the application about? Ana Lucia Varbanescu:Apparently, NLR has received a lot of complaints from people living next to the airport that the noise they are hearing is unbearable but they could not really validate these claims. So the idea was to build an application based on a tablet and a headset where you simulate an airplane flying over your head on various routes. In the same time that they are actually seeing this airplane simulated in the sky, you are hearing the real-time noise that this airplane is making. That is a very important tool to actually understand whether the claims of the people are correct and also to predict where you could for example build houses or not in the vicinity of airports. Primeur Magazine:It is a kind of augmented reality. You find yourself at a place where you normally hear the noise and you make a simulation of the airplane and of the noise and that helps to build the model. Is that correct? Primeur Magazine:And what you do, is speeding up the model so that one can hear it in real time? Ana Lucia Varbanescu:Exactly and that is the big challenge because we started from a Matlab implementation of the student who only proved correctness but could not prove performance. By modifying this and going to better performing programming models and then moving to GPUs and in the end moving to a combination of GPUs and CPUs we were able to achieve real time. Primeur Magazine:Which machine did you use to run the simulation? Ana Lucia Varbanescu:We have run the simulations on DAS-4 , a supercomputing cluster that many universities in The Netherlands share. Basically a regular gaming GPU and regular CPU that anyone could have at home would be sufficient for running the simulation. Of course, the cases we used did not necessarily have a very high resolution but the more hardware you have, there is no limitation to the amount of high resolution you can accomplish. Primeur Magazine:Are there any other applications that you are currently working on? Ana Lucia Varbanescu:Yes, we have done a lot of work on community detection which is also a very interesting application for heterogeneous computing. We have found that there, the limitation is not the processing power but the memory. We were able to literally combine the speed of the GPUs and the heavy processing that they have, with the larger amount of memory that the CPUs have. We showed that community detection can actually run on all the hardware you have and get increasingly more performance as you have increasingly more hardware. That is a very interesting result because this opens up a lot of opportunities for more community detection algorithms and more research in how we actually do community detection, not being limited by the computational resources.